Easter bunnies make wonderful holiday craft inspiration. 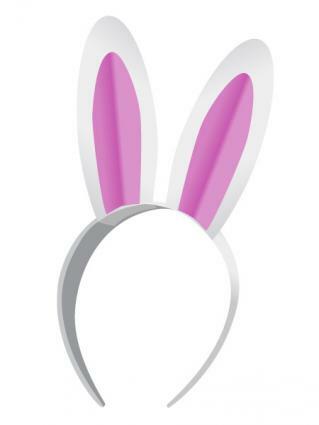 You can capture the spirit of this fun holiday by creating everything from a bunny hand print craft to wearable bunny ears. No matter which project you choose, it will make your Easter celebration even more fun. This simple craft is perfect for toddlers and preschoolers working with adult supervision, and older kids can do this independently. You can create a sweet reminder of those tiny hands, and this craft is also a great way to make an Easter card for family members who live far away. It's a quick project that takes about 20 minutes. Trace the child's hand print on a sheet of white construction paper. Cut out the hand print. Draw pink ears on the first two fingers of the hand using markers. Fold over the third and fourth fingers, then glue into place. Fold over the thumb and glue into place. Draw a face on the bunny. 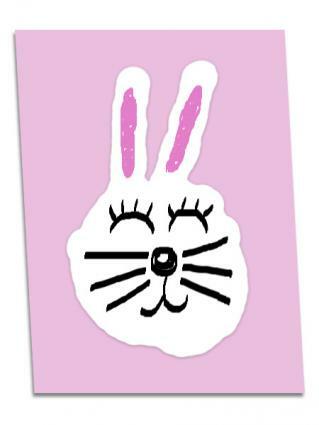 Glue the finished Easter bunny to a construction paper background. Magnets are always useful, and these bunny-shaped designs are perfect for holding up artwork on your fridge every spring. This is a fun project for older kids, as well as adults. You can make a whole set to give as a gift. Expect to spend about an hour making six magnets, not including drying time. Begin by painting all six bunnies in your desired pastel colors. Allow the paint to dry, and then apply details like the face using black paint and a fine paintbrush. Allow the black paint to dry before continuing. 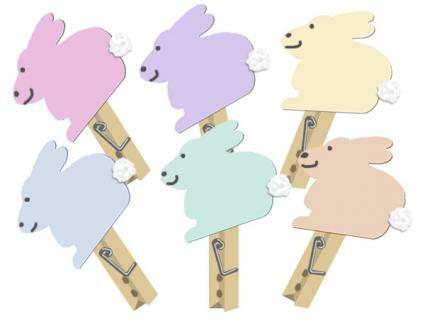 Place a dab of wood glue to the back of each bunny and add a clothespin on top of the wood glue. Allow to dry. Put another dab of wood glue on the back of the clothespin and apply a magnet. Allow this to dry as well. Finally, turn the clip magnet right side up and use craft glue to apply a white pom-pom tail to the bunny. 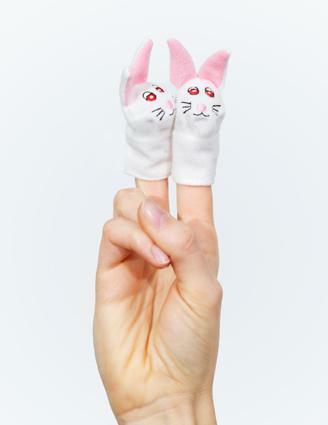 This fun finger puppet is easy to make and is a great addition to any Easter basket. You don't need to be able to sew to make this bunny, but the project does require adult supervision. Making this puppet will take about half an hour. Place your index finger on a piece of paper and trace around it. Now cut out the piece, staying about half an inch outside the lines you drew. This is your bunny body pattern. Using the pattern you made, cut two bunny body pieces out of white craft felt. Cutting freehand, make two white felt ears and smaller pink centers for the ears. Cut a tiny pink felt triangle for a nose. Place one bunny body piece on your work surface. Put a dab of glue on the end of each ear and press them in place. Run a line of hot glue all the way around the edge of the bunny body piece and over the ends of the ears. Place the other bunny body piece on top and press down. Glue the pink ear centers to the white ears. Glue the pink nose to the face. With the black marker, draw eyes and whiskers. Allow the bunny to dry completely before using it as a puppet. If you have leftover baby socks hanging around, this Easter craft will require almost no new materials. If not, you can pick up a package of white baby socks for a few dollars. You can use them to make an adorable bunny family of four in about an hour. Since this craft uses hot glue, adult supervision is required. Fill the toe of each sock with rice or beans until you get to the heel. Tie it off with a rubber band. Add more rice to create a bunny head and tie the sock off with another rubber band. Cut a V-shaped notch in the opening of the sock to make two bunny ears. Tie a piece of ribbon around the neck of each bunny. Hot glue a pink pom-pom to the head of each bunny to become the nose. Hot glue a cotton ball to the back of each bunny as a tail. Hot glue googly eyes to the face of each bunny. Draw on whiskers with the black marker. You can make these ears in any size, so they're a great craft for the whole family to make together. They're a fun, quick project that will take about 15 minutes plus drying time. Cut four bunny ears out of the white craft felt, all exactly the same size. You can make them as long as you want, but ears about eight inches tall stand up the easiest. Lay two ears on your work surface. Place the headband on top of them, overlapping the base of the ears with the headband. Add a little glue to the base of the ears to wrap around the headband. Place a line of glue all the way around each of the ears. Place the other set of ears on top, lining up the edges. Press to glue together. Add glue to the bases of the top ears, wrapping these around the headband too. Set aside. Using the pinking shears, cut two ear centers out of pink cardstock. Fold the ear centers lengthwise to make them three-dimensional. Glue the cardstock ear centers to the white felt ears, adjusting so the ears will stand up when the headband is on. Allow everything to dry before wearing. 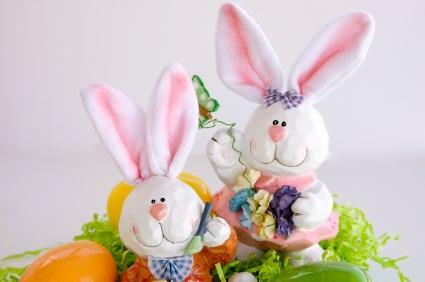 No matter which Easter bunny craft you make, you'll enjoy this creative holiday activity. Crafting together, whether you're making decorations or wearable ears, is a great way to make holiday memories with your family.